Franco signed a one-year, $5.2 million deal with Philadelphia to avoid arbitration, Todd Zolecki of MLB.com reports. Franco once again showed some pop during the 2018 campaign, launching 22 homers and driving in 68 runs in 131 games. 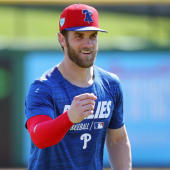 He's on track to begin the 2019 year as the starting third baseman and will shift his focus to getting ready for spring training after coming to terms with Philadelphia.